From the legacy of generosity of June “Jaye” Harris and her late husband, Jack C. Harris, comes the history and political science pillar of the Mahoning Valley Lifelong Learning Institute. The Harris endowment will bring to the Institute views of past as well as current events, including their implications on the future. Topics may include government, social and cultural issues. When Jack Harris married Jaye McDowell in 1955, it was the beginning of a lifelong partnership of two like-minded individuals who have long supported causes they believed in. Born in Youngstown, Jack spent his life achieving his goals, never letting life’s obstacles hold him back. In the 1940s he spent eight years in a tuberculosis hospital. He had to have his right lung removed. He had been told he would probably have to carry oxygen with him all his life from that point, but he didn’t begin to do that until the year 2000. Prior to his illness, Jack earned an electrical engineering degree. Later, he used his photography talents to pay his way through night law school. He was interested in many things, including experimental aircraft and theater, pursuits he enjoyed in high school. He helped many causes and held memberships in organizations such as the Mahoning County, Ohio, and American Bar Associations. He served as president of KSU National Alumni, Southside Chatterbox Club and Ohio Living Park Vista North Residents Association. During his professional years, he was a partner with the Wilson and Wyatt firm, also his own firm Lanz and Harris, and chief trial attorney with the Manchester, Bennett, Powers and Ullman firm. Just some of his charitable works including counseling for the youth fellowship of Christ Church Presbyterian, where he was a longtime member. He was a board member for the local and state Ohio Presbyterian Homes and Ohio Living, formerly Ohio Presbyterian Retirement Services. After a career in finance, Jaye pursued her interest in art and her paintings have been popular. 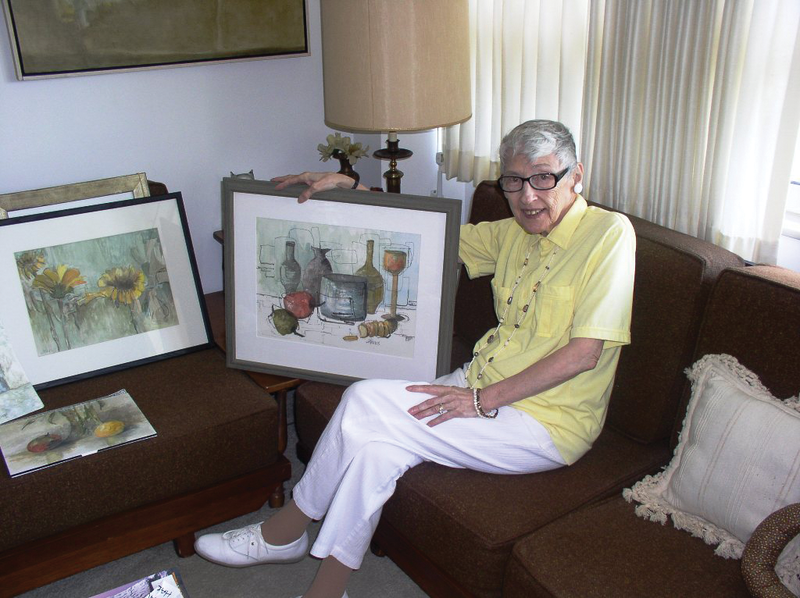 The Ohio Living Park Vista painter earned herself a winning spot in five of the Ohio Living resident art calendars. Her financial expertise and background include having served as a statistician for the Ohio Turnpike Commission and her work as an actuarian for several insurance companies for many years. She and Jack, who died in 2004, have been longtime donors to Ohio Living Park Vista, and Jaye also has served in several leadership positions with the parent company, Ohio Living.